HonestReporting's latest communique entitled Time Magazine Gets Caught Lying contains the usual distortion and general dishonesty that permeate most of their communiques. It also includes a complete fabrication. This communique concerns a Time Magazine caption on a photo taken by Bruno Stevens during the recent war in Lebanon. HonestReporting states that Time's caption "Deliberately contradict[s] the photographer's account of events" and that Time accepted "the claims of a terrorist organization over that of its own photographer". Sounds serious. Let's start by looking at the captions. Here is the caption that Stevens sent along with his photograph: "Kfar Chima, near Beirut, July 17, 2006 An Israeli Air Force F16 has alledgedly been shot down while bombing a group of Hezbollah owned trucks, at least one of these trucks contained a medium range ground to ground missile launcher." 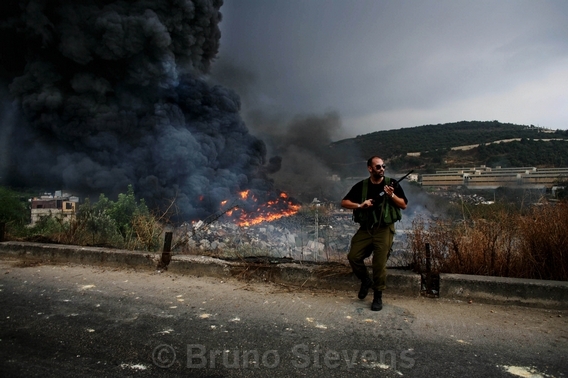 Here is the caption that Time actually printed: "The wreckage of a downed Israeli jet that was targeting Hizballah trucks billows smoke behind a Hizballah gunman in Kfar Chima, near Beirut. Jet fuel set the surrounding area ablaze." So far, so good. Those are essentially the same and Time printed the caption that the photographer sent in. Sometime, at a later date, the photographer updated his caption and removed references to the downed Israeli jet. HonestReporting is upset that Time used Steven's original caption, not the updated version, in their article. Believe it or not, but this is the "lie" HonestReporting is referring to. HonestReporting then makes a gross misrepresentation by claiming that "Stevens quickly followed up and clarified that the destruction he photographed" wasn't a downed Israeli jet. There is no evidence at all that Stevens "quickly followed up" with the updated caption. In fact, Stevens doesn't specifically mention when he updated the caption. On Lightstalkers, he states that the caption was updated only after going back to the site three more times and collecting more evidence. Stevens does not state how many days it took him to do this. For HonestReporting to describe this as "quickly" is a gross misrepresentation. The truth is that HonestReporting has no idea if Steven's updated caption was received by Time soon enough to be used in print. In addition to deceiving its readers about the timing of the updated caption, HonestReporting also fabricates the existence of a conflict between Stevens and Time Magazine. HonestReporting states that Steven's "anger at having his caption changed can be read on Lightstalkers." Anyone who bothered reading Lightstalkers will know that Stevens mentions absolutely nothing about any anger toward Time about the caption that was printed. Another fabrication by "HonestReporting". It's amazing that HonestReporting would need to be so consistently deceptive in order to show anti-Israel bias in the media.